Taj Safaris opens its first lodge outside India: Meghauli Serai at UNESCO World Heritage listed Chitwan National Park, Nepal. This park is a traveller’s dream. The Sal groves, thick grasslands and water bodies, with the variety of wildlife, make it one of the most sought after destinations in Nepal. Located on the banks of the Rapti river. 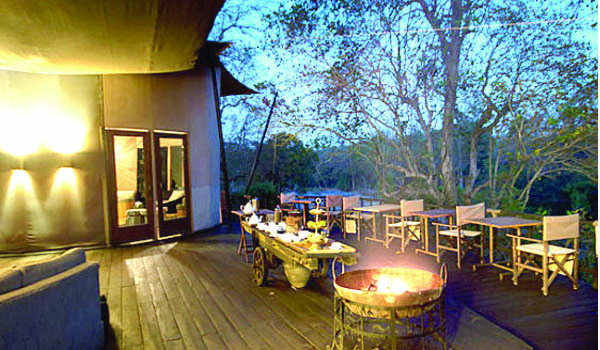 Meghauli Serai offers spectacular views of the park across the river. The Serai has 30 rooms and lavish suites. There are 550 native bird species, including the Great Hornbill, Ruddy Shelduck and Pied Kingfisher and approximately 68 species of mammals at Chitwan Park. Meghauli Serai has Newari and Tharu-inspired front doors in earthy tones that match the landscape, to the locally-sourced ingredients. Interesting wildlife experiences blend with beauty of rustic Nepal. Safaris on elephant-back, by jeep and jungle walks make it complete. Walks through the local Tharu village showcase traditional village life, where guests can learn the tricks of moonshining for traditional brews. They can try fresh homemade Nepalese pickle. Trekking through the beautiful Himalayan foothills is a delight for adventure-seekers. Meghauli is easily accessible from Kathmandu by road or by flight. It takes a 20 minute flight from Kathmandu to Bharatpur airport, followed by a 45-minute or 30 kms drive to Meghauli Serai Jungle Lodge in Chitwan National Park.